Grilling the bread does something wonderful for this dish! Every year I wait for the tomatoes to ripen. My husband loves to garden, and he grows at least five heirloom varieties every year, but we live in Buffalo, NY and it seems to take forever to grow tomatoes! When we finally get a good haul, we eat grilled bruschetta for days. It’s my favorite thing to do with tomatoes, so it was the perfect appetizer for Sean and Olivia to make for their cooking class in LUSCIOUS. 1. Use a serrated knife to slice the bread into ¼ inch rounds, on the bias. That means set your knife up at a 90 degree angle to the bread, and then twist the knife about 30 degrees to the side and start sawing. 2. Brush the bread with a little bit of olive oil, and sprinkle it with salt and pepper. Heat the grill. 3. Next, make what we refer to in my house as “tomato glop.” Dice your tomatoes, leaving as many seeds as possible on the cutting board. Fold the basil leaves into a tiny package, and slice it across one way to make thin ribbons. Then slice across the other way to chop. Use a Chef’s knife to mince your garlic and smash it into a paste with the salt. Mix the tomatoes, basil and garlic in a small bowl. 4. Grill the bread until each side is marked. 5. 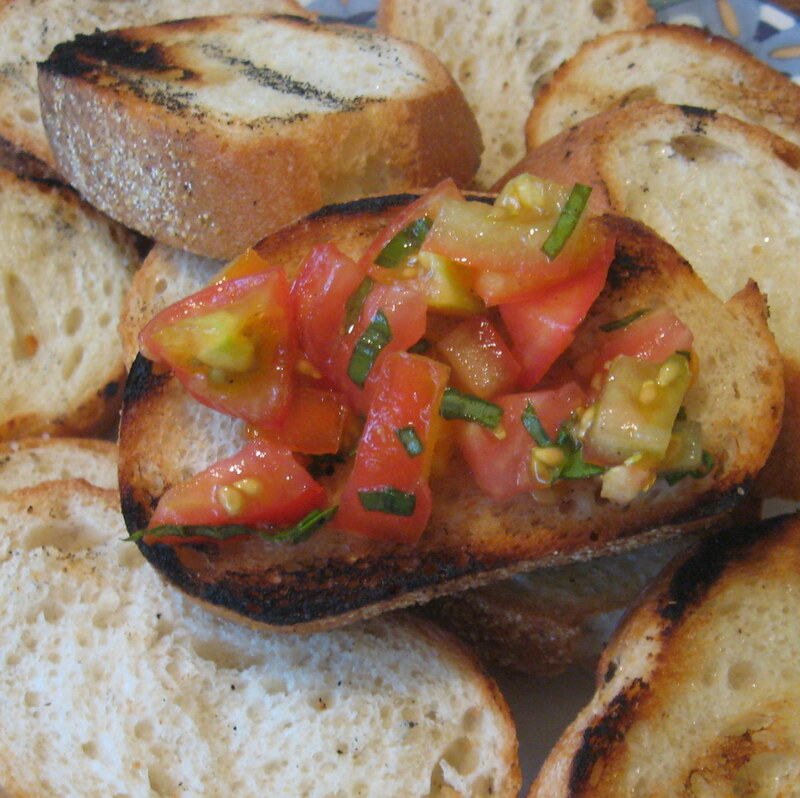 Top each slice of bread with the tomato mixture. Sprinkle with Parmesan cheese. Eat. Mmmmmmm! Summer lovin’!